Indian Motorcycle has launched the 2016 Indian Springfield in India at Rs 30.6lakh (ex-Delhi). Bookings have begun on April 15, 2016 and deliveries will commence in August, 2016.The motorcycle will be offered with a choice of two colours. Speaking at the launch, Pankaj Dubey, managing director, Polaris India Private Limited said, "The Indian Springfield offers a good mix of touring comfort and urban versatility through its blend of classic styling and comprehensive modern technology. The launch of the iconic Indian Springfield is part of our strategy to introduce products which would take the growth story of Indian Motorcycle to the next level in India. It has been launched to inspire a new generation of riders and satiate their wanderlust. Using a tourer-oriented steering geometry that gives it better handling on the open road, the 2016 Springfield with considerable additional touring capabilities delivers on the tradition of great Indian Motorcycles. 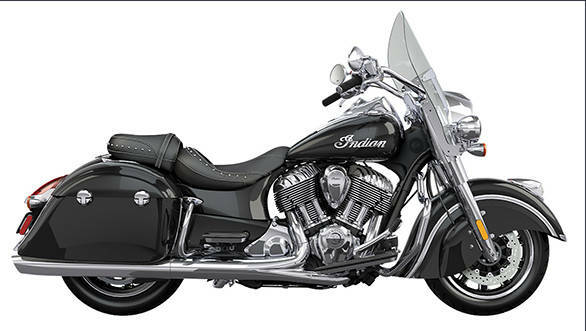 Indian Springfield fits perfectly into the Indian line up putting more than enough power to keep you smiling. " 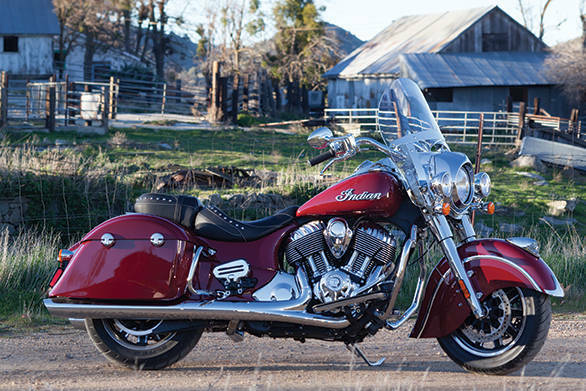 The Indian Springfield gets its name from the birthplace of Indian Motorcycle. It features a quick release windshield and all-weather, remote-locking saddle bags. The Springfield looks like the Chief Vintage, however, the chassis is all new and capable of carrying higher loads. The company says the bike can carry a total weight of 242kg (rider+pillion+luggage). It gets the fuel-injected, Thunderstroke 1811cc V-Twin engine, that also does duty in the Chieftan, Chief Vintage and the Roadmaster. The motor develops 139Nm at 2,600rpm. The standard feature list includes ABS, tyre pressure monitoring system, electronic cruise control, front and rear highway bars, dual riding lights and remote locking. Customers can also opt for additional accessories, that include, tall and low windshield, heated driver and passenger seats, a 64.3 litres accessory trunk and heated grips. New Delhi 16th April, 2016:Polaris India Pvt. Ltd, a wholly owned subsidiary of Polaris Industries Inc., the world leader in off-road and All-Terrain Vehicles, yesterday announced the launch of the all-new 2016 Indian Springfield. Named after the birthplace of Indian Motorcycle® and designed for a pure riding experience, the Indian Springfield is a soulful and versatile new addition to the 2016 lineup. Commenting on the launch of the all-new 2016 Indian Springfield, Mr. Pankaj Dubey, Managing Director, Polaris India Pvt. Ltd said, "The Indian Springfield offers a good mix of touring comfort and urban versatility through its blend of classic styling and comprehensive modern technology. The launch of the iconic Indian Springfield is part of our strategy to introduce products which would take the growth story of Indian Motorcycle® to the next level in India. It has been launched to inspire a new generation of riders and satiate their wanderlust. Using a tourer-oriented steering geometry that gives it better handling on the open road, the 2016 Springfieldwith considerable additional touring capabilities delivers on the tradition of great Indian® Motorcycles®. 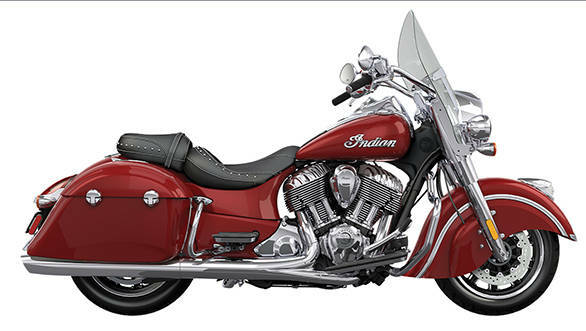 Indian Springfield fits perfectly into the Indian®line up putting more than enough power to keep you smiling. " Inspired by the rich heritage of Indian Motorcycle®, the Indian Springfield offers classic styling blended with thoroughly modern technology for a purist's take on both touring comfort and urban versatility. The Indian Springfield can be quickly converted into a cruiser with the quick-release windshield and saddlebags removed, or transformed into a high-capacity touring model with Genuine Indian Motorcycle® accessories. While maintaining the style and luxury for which Indian Motorcycle® is renowned, the Indian Springfield makes its own distinctive mark in the bagger and touring category. While related to the iconic Indian Chief® family, the multifaceted Indian Springfield hard bagger was developed with a unique new trunk-compatible chassis for higher loading capacity and a premium touring experience without sacrificing handling prowess. Designed for an unobstructed view of the road ahead, the Indian Springfield sports a bespoke quick-release windshield that creates a large air pocket for rider and passenger comfort. Other comfort features such as remote locking hard bags and adjustable passenger floorboards come standard along with real leather seating, high-resolution Anti-Lock Brakes, tire pressure monitoring, electronic cruise control, and a powerful headlight and dual driving lights. Standard front and rear highway bars allow mounting of accessories and offer valuable protection from tip-overs. Brightly chromed forks, headlight housing, fender trim, engine covers, exhaust and handlebars with internal wiring bring the shine along for the ride. "The new Indian Springfield wasn't designed to fill a space in our line-up; it was built to fill a space in the hearts of riders who value the rich heritage and fine craftsmanship of Indian Motorcycle®, and who want both a pure touring bike and a sleek urban cruiser," said Steve Menneto, President of Motorcycles for Polaris Industries. "The Springfield's unmatched versatility will win the hearts of motorcycling purists around the world." Powered by the highly regarded Thunder Stroke® 111 engine, the Indian Springfield delivers 138.9 Nm @ 2600 rpm of torque to conquer any highway in any weather. Its unique new chassis was designed to handle a wide load range, featuring cartridge forks and an air adjustable rear shock with 11.43 cm of travel for safely transporting up to241.7 Kg. in style. Touring comfort can be further enhanced with a full line of accessories including a tall and low windshield, heated driver and passenger seats, soft lowers, a 64.3 Litres accessory trunk and heated grips to keep riders comfortable in cool temperatures. Yet in minutes its quick-release windscreen and saddlebags can be removed creating a classically styled, high performance cruiser. The split seat, featuring a unique stitch and stud pattern, can likewise be trimmed down to create a tight and low solo look, giving the Indian Springfield a truly customizable personality.